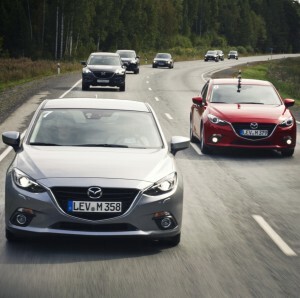 A fleet of all-new Mazda3 hatchbacks are celebrating the completion of an epic 9,300mile Russia to Germany test drive. The convoy crossed the finish line at Mazda’s European R&D Centre in Oberursel, just outside Frankfurt, on Saturday – right on schedule. All vehicles withstood the expedition fully intact, with some of the Mazda3 tour cars set for exhibition at the Frankfurt Motor Show. The overland portion of the Mazda Route3 tour began on August 3, after the cars had been shipped from Japan to Vladivostok. Starting out from Russia’s Far East, they covered two continents, five countries, nine time zones and some 30 cities. Crewed by journalists, media and Mazda dealers, the Mazda3 teams took in a variety of sights, including Lake Baikal, the Altai Mountains and the Kungur Ice Caves. They stood on the border between Asia and Europe, and were escorted on more than one occasion by dozens of Mazdas driven by local fans. During the final leg, they visited four European capitals – Moscow, Minsk, Warsaw and Berlin. Jeremy Thomson, Managing Director of Mazda UK, said: “What an adventure! “If I had to single out the one aspect of the Tour that was most impressive, I’d say the interaction – of the people along the way, with the Mazda Route3 participants, with the support team, and of course with the cars. “The all-new Mazda3 hatchback test cars, powered by a 120ps SKYACTIV-G petrol engine mated to a six-speed SKYACTIV-MT manual transmission, were such a joy to drive and at the same time so tough and so reliable, even when conditions were worse than anyone expected.